You will be overjoyed to visit the Lae Lay Grill with your tour companions. 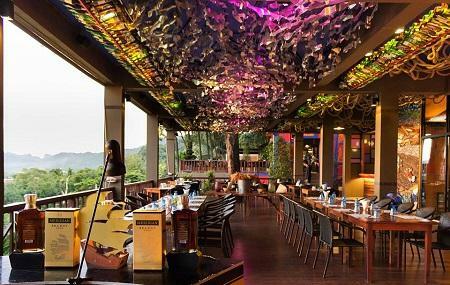 To savor the taste of authentic Thai cuisine, you can pick any of the dishes that this wonderful bistro serves. The very restaurant is a specialist of serving seafood and it also boasts some exclusive platters of its own. The A La Carte and dessert menu of this eatery is impressive too. A lot of people come here to enjoy mainly dinner. Wok-fried Blue Crab, Deep Fried Bass and Wok-fried Scallop are some of the signature items of this restaurant. Blending rare spices, the chefs of Lae Lay Grill creates unusual dishes that will make you happy for sure. How popular is Lae Lay Grill? People normally also visit Ao Nang Beach while planning their trip to Lae Lay Grill. We were a group of around 30 people having a college reunion. The place is beautiful and views quite stunning at sunset. The staff were extremely nice and bent over backwards to accommodate us even though we booked the day before. They were also super attentive. Food was delicious and we looked at the kitchen too which was really clean. I would definitely recommend this place! Amazing restaurant with an absolutely stunning view. The food came really quick and everything was delicious and perfectly cooked. Very professional and friendly staff. We even got free transfer back to hotel after our dinner. I wish there was more tables with the extraordinary view. So make sure to make a booking to get it. Had a wonderful sunset dinner at Lae Lay Grill. Absolutely loved the lobster which went really well with their sauce dips. Service was also good. Prices are on the higher end, so come here for a special occasion. Amazing experience. Wondeful location with ocean view, the food was simply amazing (we ordered the sizzling fish and scallops). Great service too. Somewhat pricey compared to other restaurants in the area, but worth every penny. Highly recommend this place!